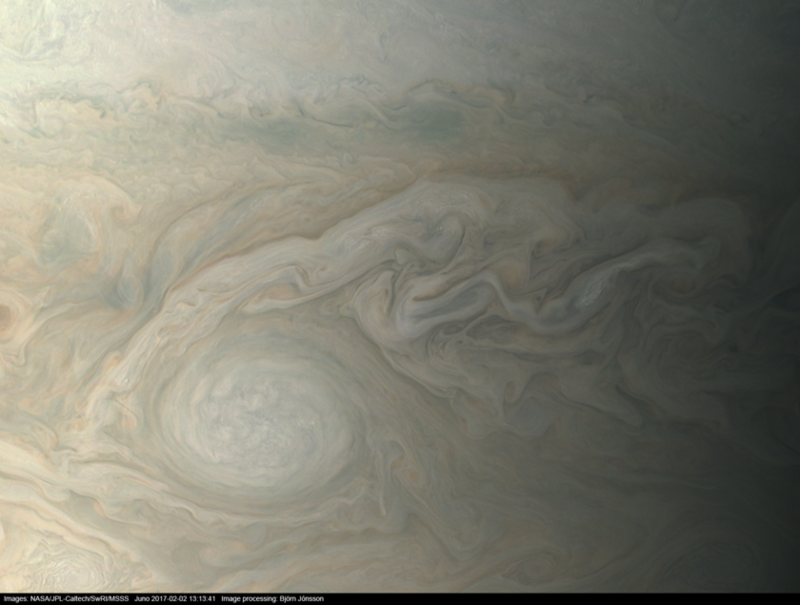 JunoCam images can be described in one word: awesome. 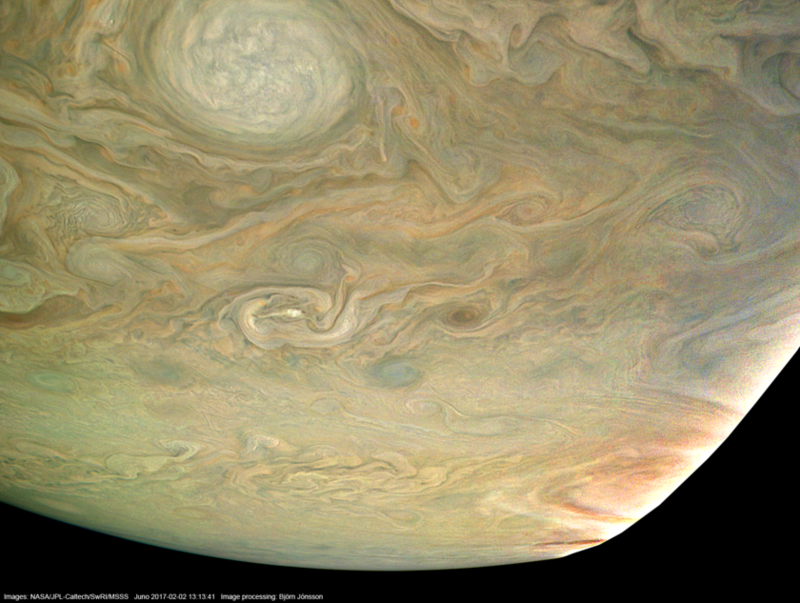 They are a lot more challenging to process properly than Voyager, Galileo and Cassini images, but the resulting images are every bit as spectacular as the ones from earlier spacecraft. The color, in particular, is much improved since the days of Voyager. Here are a few images processed from the image 106 raw framelets acquired during Juno's fourth perijove orbit (third science orbit). This is the "POI: Oval BA" observation. In the three images below, the effects of global illumination have been removed. The contrast and color has been exaggerated, and small scale features sharpened, to better reveal various features and color variations. 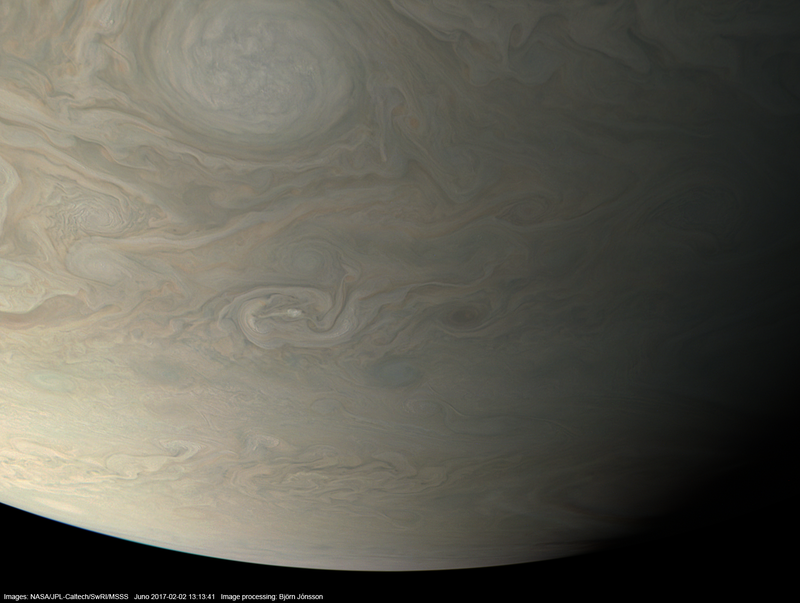 This view of Jupiter was obtained by the JunoCam during Juno's 4th perijove flyby, a mere ~14,500 km above the planet. The effects of global illumination have been removed, and contrast and color have been exaggerated and small scale features sharpened to better reveal various features and color variations. 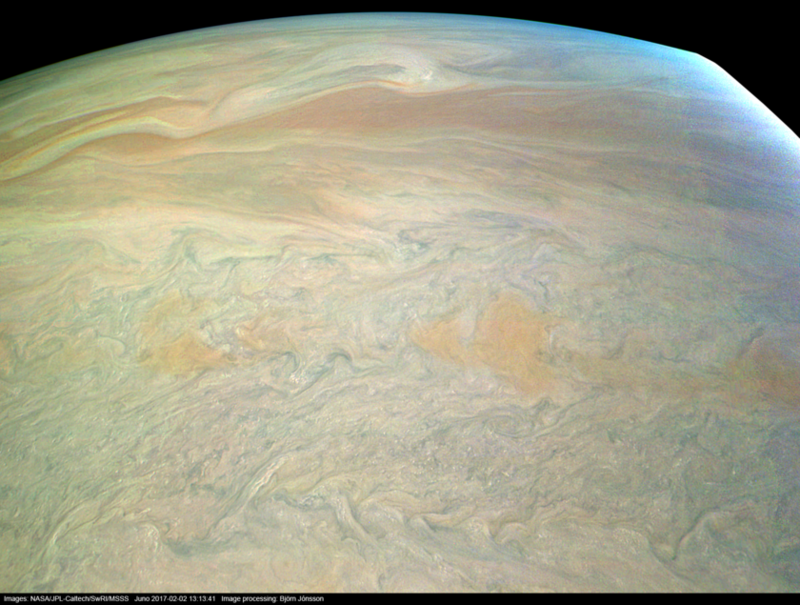 This view of part of Jupiter's "string of pearls" near 40°S latitude was obtained by the JunoCam during Juno's 4th perijove flyby, a mere ~14,500 km above the planet. The effects of global illumination have been removed, and contrast and color have been exaggerated and small scale features sharpened to better reveal various features and color variations. These images show an enormous amount of small scale detail. Cloud shadows and vertical relief are clearly visible at many locations. The fairly big oval visible in these images is one of the "string of pearls" ovals near latitude 40°S latitude; this is oval A1. S = Spacecraft ephemeris, P = planet ephemeris, I = instrument description including FOVs, position and orientation on the spacecraft, C = spacecraft and/or instrument dynamic orientation, and E = Event or Experimenter's description of the observation effort. For the best results, I had to make corrections to the camera pointing. I then used a 3D renderer to create perspective views of an oblate spheroid, using the spacecraft's location and the camera pointing at three different points in time when JunoCam was acquiring the original framelets. 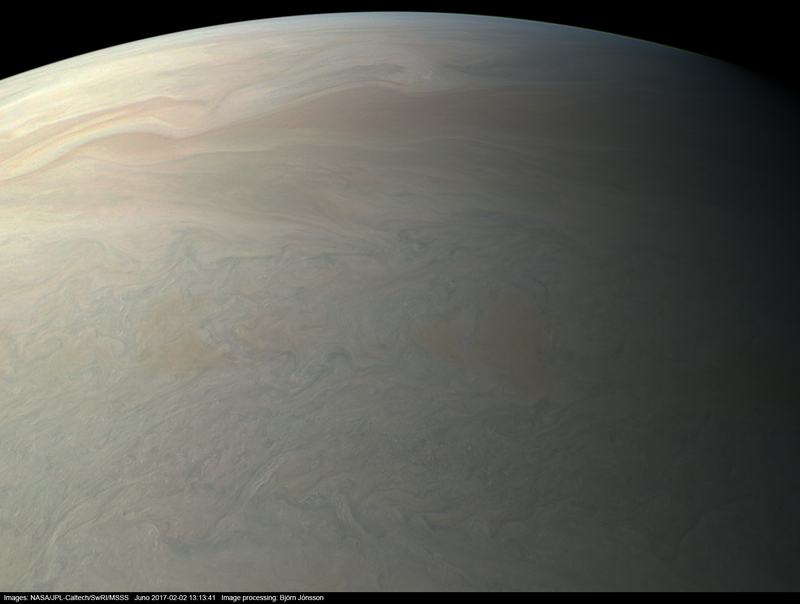 Since JunoCam has a very wide field of view (58°), these images should give a fairly good idea of what a naked eye view from Juno's location would look like. This is different from Voyager, Galileo and Cassini images, where the field of view is less than 0.5°. The images from these spacecraft are therefore more similar to what one would see through a small astronomical telescope from a distance of a few million kilometers from Jupiter. 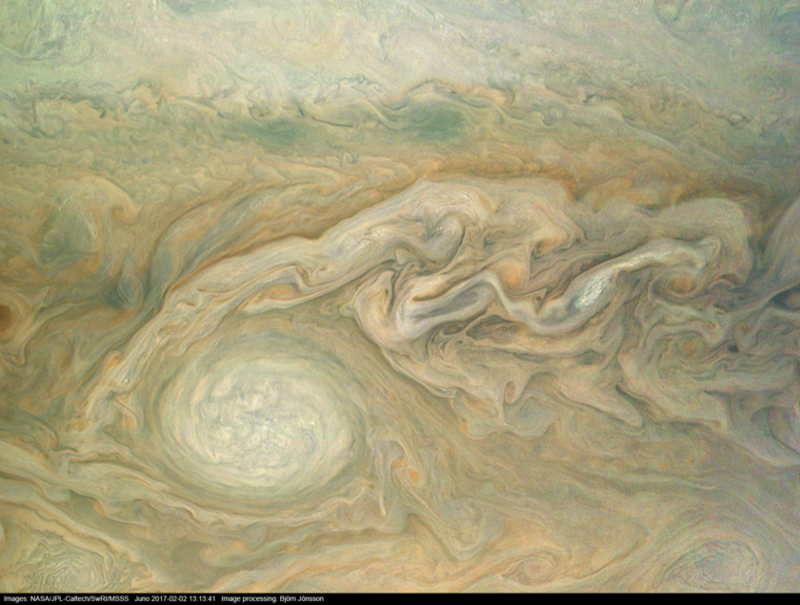 Juno's altitude above Jupiter was only about 14,500 km when the original images were obtained. Therefore, the area covered by the images isn't particularly big. Below is a quick and dirty context view. 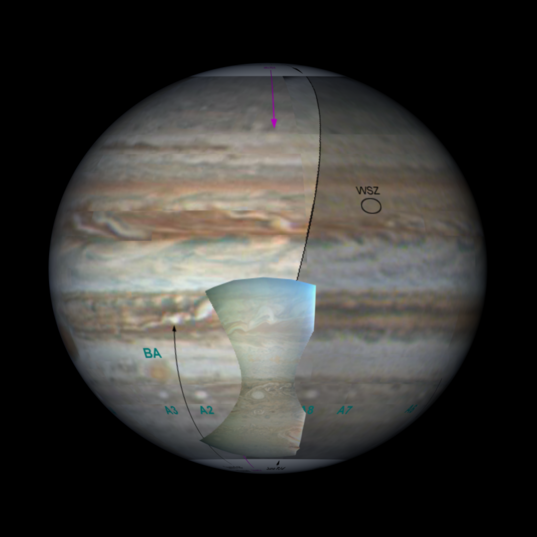 It is based on John Rogers' Perijove 4 (PJ4) predictive map that can be seen here. 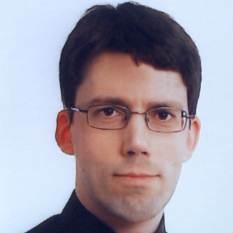 Nýbúin að taka eftir nafninu. Vissi ekki að það væri íslendingur að skrifa á bloginu :) Takk fyrir að deila myndunum!